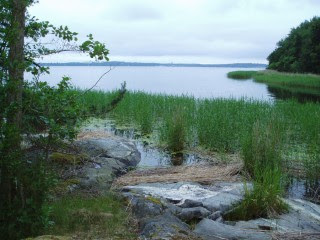 Last week-end was Midsummer's holiday, Sweden's big national outing-and-getting-rained-on-week-end. Weather usually is bad, and this year was no exception. 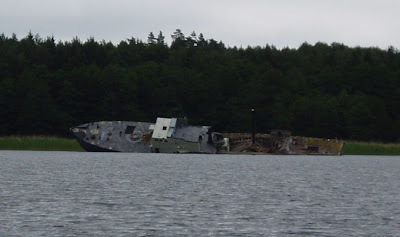 Two friends and I had planned a 4 day cruise, but due to bad weather, we shortened it a bit. Yesterday we went out in ovecast weather and a bit of a drizzle, moderate winds. Weather improved eventually and when we stopped for a very late lunch at 1700 near an interesting wreck of an old warship we actually saw a bit of the sun. 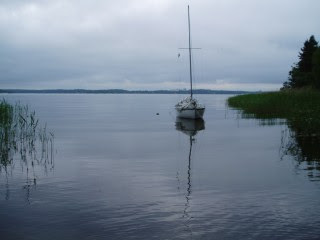 We then sailed on to the cove where we intended to spend the night and it was calm and nice. 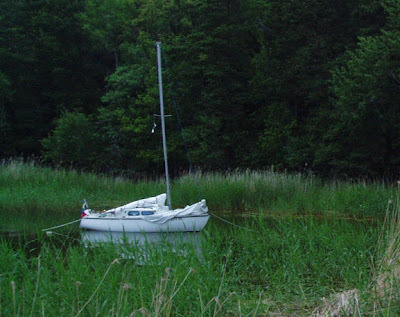 We had to anchor as there was no suitable rocky shoreline to moor to (no tides in this part of the Baltic), and take the inflatable to get ashore. At first there was a powerboat with an elderly couple anchored as well, but they left after dinner, so we had the tiny cove for ourselves during the night. Just after sunset suddenly appeared a lot of bats! They flew low over the water, probably eating mosquitos. This was the first time I ever saw real life bats! And so many of them. After a quiet night and a good breakfast we left in almost no winds, still under sail though. Eventually the breeze picked up and we had a nice sunny day and a very pleasant sail home. Now I have only to work for two more weeks until my real vacation starts!